Having discovered skiing’s best kept secret it’s easy to see why our guests joke that they won’t let on about it! Puy St Vincent is safe, convenient, friendly, boasts 300 days of sunshine, a micro-climate and a snow record the envy of bigger ski stations. First timers are amazed just how convenient everything is. Our accommodation sits on a sort of mountain quad at 1600m right in the middle of the skiing. On one side is our beautiful crèche and Snowbizz office, to the other side, is the Toton Ski Garden. And at ground floor level of the Sun Vallee Residence is our Junior Ski School Club Room. All of this is within minutes from each other so there’s no need to wait for a mini bus to take you to the childcare facilities or ski runs. Walk out of your locker room and you’re right there in the middle of everything. From any of the number of little bars and restaurants you can watch your children skiing, or even watch from your piste facing balcony. Immediately from your locker room you can ski down to 1400m or take one of two of the lifts that are directly opposite, linking you to 2000m with a choice of more lifts to 2750m. And at the end of the day you can ski right up to the accommodation locker room door. 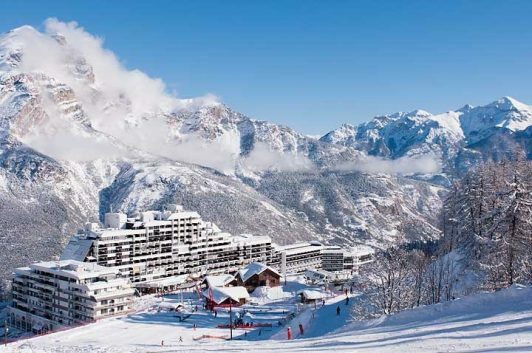 The pistes are quiet and apart from holidays there’s rarely any lift queues – so for most of the season it’s a dream. Which means you can get the most amount of ski time from your holiday. Sometimes on a run like La Draille you won’t see a single other skier. Typically we find that families who travel with Snowbizz are at different skiing abilities – dad could be the advanced skier with mum a bit more reluctant and the children at various levels of energy and enthusiasm. Puy is perfect when skiing as a family as there is genuinely something for everyone – and with it being a smaller resort it’s easy for you to ski different runs but then easily meet back up again. Most families opt to let us look after the children in the morning, then ski together as a family in the afternoon. But as every family is different we offer flexi-childcare, which allows you to tailor the childcare package to what suits your individual family needs. As Puy is a small resort, we employ a team of around 8 to work in the resort for the winter season. With us having such a small team it means that you as our guest really get to know them during your holiday. After almost 30 years of Snowbizz we recognise just how important it is to have the right team in resort. Each year we strive to employ the very best team to make your holidays as stress free, fun and memorable as possible. We look for hard working, enthusiastic and fun individuals who have a genuine love for working with children and are ready to go the extra mile. As one guest recently said ‘every single person was fantastic – this is so critical for an enjoyable holiday’. As Puy is a smaller resort parents can allow a little ski freedom to youngsters. Newish skiers can be given some slack on one of the blue runs at 1600m which allows you to watch from the bar. And older, more competent children are often allowed their own ski time with some of the runs leading up to 2000m as all the runs lead back to 1600m – so they can’t get lost. Also we’re the only British Tour Operator in resort and Michel, our director, is on hand every day managing the children’s ski school. Each instructor has a radio and can contact Michel if ever they need to, so you can have peace of mind that we will always know what’s happening in the lesson and if there is ever a problem.